Brain Robot Research: How seriously is Indonesia doing research on Brain-Computer Interface? 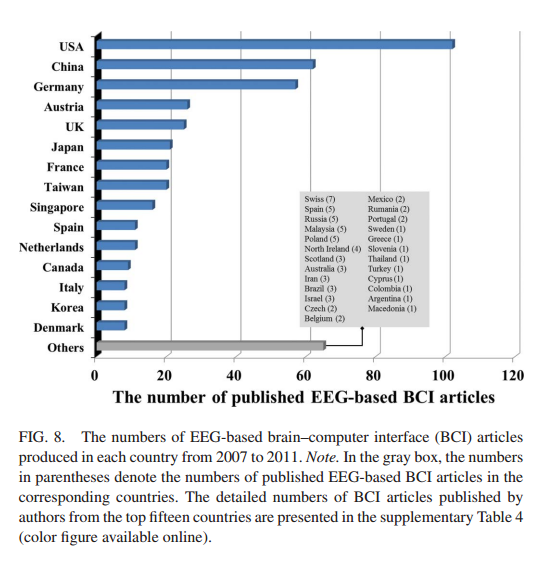 Below is the figure of literature study of EEG-based BCI between 2007 and 2011 from Hwang, et al in 2013. The paper is "EEG-Based Brain-Computer Interfaces: A Thorough Literature Survey" in International Journal of Human-Computer Interaction, 29: 814-826 (doi), from Taylor & Francis. The authors are Han-Jeong Hwang, Soobeom Choi and Chang-Hwam Im from Hanyang University in Seoul, Korea, and Soyoung Kim from University of Rochester, New York, USA.